The Guardians of the Galaxy vol. 2 toys feature a few figures that are pretty close to the 2014 releases - Star-Lord and Drax, namely - but there's no Groot. For that, you have to go to Toys Я Us. From potted prodigy to towering tree-like humanoid, Groot uses powers of regeneration to become a legendary defender of intergalactic justice. Ugh, when will the liberal media stop shoving its Intergalactic Justice Warriors down-- wait, we already did that joke just a couple weeks ago. So are we the ones who are stuck in a rut, or is it Hasbro's copywriters? Also, did you ever think of Groot as having "powers of regeneration"? Clearly he does have them (his arms grew back after Gamora cut them off, after all), but it's not like that's where your mind immediately goes when someone says "Groot," is it? Wolverine has regeneration; Groot just has the proportionate speed and strength of the Giving Tree. Big mighty tree man can grow back from a toothpick, but that still feels like focusing on Superman's super-ventriloquism to the exclusion of everything else. 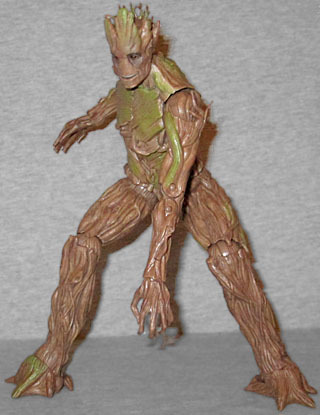 In the first series, Groot was the Build-A-Figure. And this one uses almost the entirety of the same mold, just like the box set Groot. The body does not just look like a tree that happened to grow in the shape of a man: his feet may resemble roots, but the legs are more like bundles of thick vines than the trunks of trees (and the same goes for his arms); his torso looks particularly anatomical, with large, flat patches of wood where a human would have muscles. It's particularly noticeable on what would be pectorals, but you can also pick it out on the abdomen, shoulder blades, and his big flat buttocks. He definitely looks like a humanoid tree, there's just a bit more emphasis on the "humanoid" than the "tree." His right fingers hang loosely, while his left hand looks ready to grab something. Because Groot is about 9¼" tall, he's too big to fit in the standard Marvel Legend packaging - to save space, he's packaged with his shins detatched and stacked beneath him. Like cordwood! Once you plug the knees in, he has all the same articulation as before: a balljointed head, swivel/hinge shoulders, swivel biceps, double-hinged elbows, swivel/hinge wrists, a swivel/hinge chest, swivel/hinge hips, swivel/hinge knees, and swivel/hinge ankles. What's new about him is the head. The toy three years ago had a neutral/frowny face, while this one is smiling. Like, a "look at me, I just murder-stabbed an entire room full of Sakaarans" smile. It's much more personable than the last release, and has golden pupils in his black eyes. As long as they were giving us one new head, however, it's a shame they didn't do a second in a "yelling" pose - we've seen custom molds that created that face, and it would have added more value to this exclusive. You're not just getting a new head on an old BAF, though. 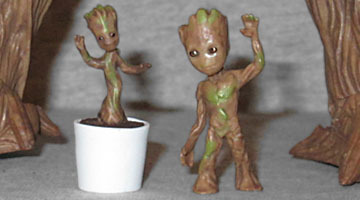 This set is technically known as "Groot Evolution," and it comes with two extra figures: one is Potted Sapling Groot, as seen dancing at the end of the first movie, while the other is the second movie's Baby Groot, in the friendly waving pose seen in the trailers. They're both all-new sculpts, with very nice paint jobs. All three Groots (Greet?) are tan with a bit of green highlights, while the pot is white with dark brown dirt. They could have given us Baby Groot's bomb, as well, but just getting three Groots is nice enough. 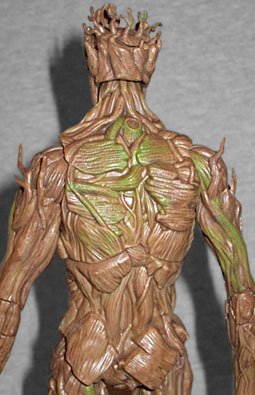 Although this Groot is mostly the same as the one we got for the first film, there were plenty of fans who didn't get a chance to build that figure. Surely Hasbro could have added some extra value to this TRU exclusive (an alternate head, a bomb, something), so that longtime fans weren't paying $20 just to get a smile and two smaller Grootlings, but getting that smile and those Grootlings is fun.